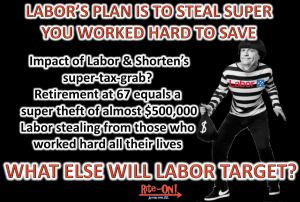 Labor is Stealing Superannuation & Retirement in a $59 Billion Grab - Rite-ON! Shifty Bill Shorten & Labor are at it again, siphoning off Superannuation. 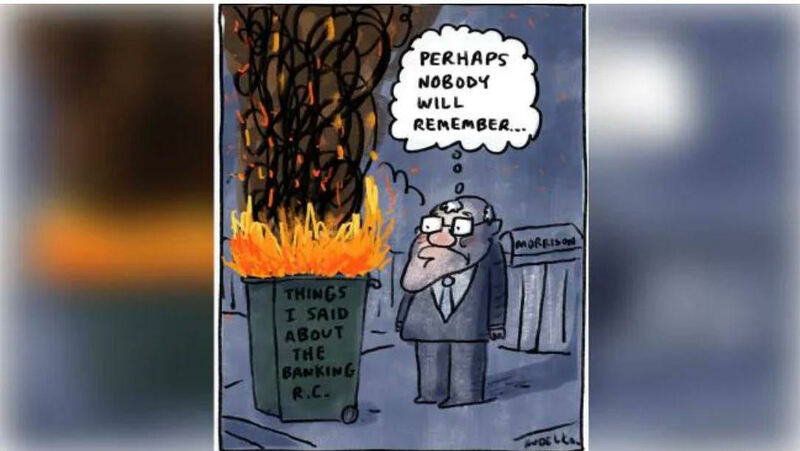 They want to steal the superannuation savings of currently working Australians and retirement incomes of current retirees and are facing a backlash to their $59 billion revenue grab on dividend payments at the next federal election. Up until the year 2000, franking credits could only be used to extinguish any outstanding tax liability. 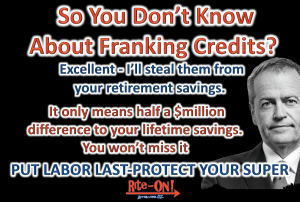 Taxpayers with franking credits above and beyond those amounts simply lost out. In 2000 the Howard government made the principled decision to refund the entire amount owed to the taxpayer to restore fairness and equity. 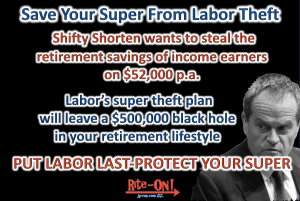 Shifty Shorten & Labour now propose to revert to the pre-2000 superannuation approach, and taxpayers will be hit hard. The important question becomes, who are these taxpayers likely to be losing out? Answer: current and future elderly Australians are the losers. Labor’s policy is not just a raid on the living standards of the currently retired (former workers), it is a raid on the superannuation funds & balances of every working Australian. The impact will be felt by hundreds of thousands of Australians who have funded or are saving superannuation for their retirement, sparking fury from those who contribute to, manage their own superannuation or manage superannuation savings in the interest of others. Scrap the ill-conceived superannuation plan. Amid warnings that Labor’s revenue raid would force current retirees to sell their assets faster and fall back on the Age Pension earlier, and would diminish the superannuation savings balances of currently working Australians, the Government accused Mr Shorten of “stealing” tax refunds from superannuants & pensioners, and along with groups including National Seniors Australia and super fund owners have called on labour to scrap the ill-conceived superannuation plan. 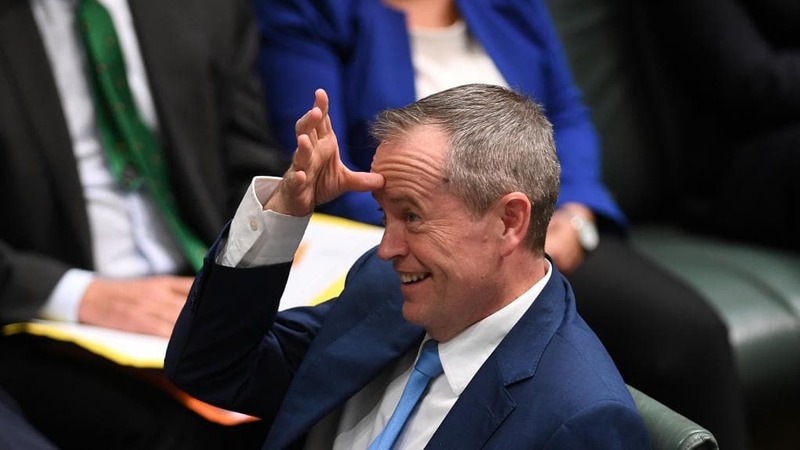 However, SHIFTY SHORTEN & LABOR claim that the current system favours high income earners & have launched yet another divisive “class warfare” campaign. Under LABOR’S RAID on Australians hip pockets, those with higher incomes & property investments,would ACTUALLY see no change because most would be able to use ALL franking credits to offset their tax bill, while those on lower incomes would lose excess franking credits cash refunds they rely on for their household budgets. LABOR’S plan clearly is a raid that impacts low to middle income taxpayers, NOT necessarily the big end of town as SHIFTY SHORTEN’S DIVISIVE CLASS WARFARE CAMPAIGN CLAIMS. Michael Lorimer, the managing director of the Self Managed Super Fund Owners’ Alliance agrees, “It fails the test of fairness because it will benefit taxpayers on higher incomes at the expense of those on lower incomes”. The reality is that the current refund system allows ALL taxpayers to benefit from the totality of their franking credits by way of either tax offsets and/or refunds of excess credits. It is FAIR to ALL!! Let’s look at a person who starts work at age 20 earning a low-moderate $1000 per. week which increases by 1% per annum, and contributes 9% to a superannuation fund towards retirement. The superannuation fund invests in only blue chip dividend yielding shares that pay a conservative net 3% per annum dividend plus franking credits and also grow at 3.5% face value per year. The superannuation fund holds those shares, and reinvests dividends and annual contributions into similar shares. We will assume that the Corporate tax rate remains at 30% and the Superannuation Earnings tax rate remains at 15%. IMPACT:- If the fund continues to receive a refund of excess franking credits each year, this person’s balance on retirement at age 67 would be $2,503,710. If the fund does NOT continue to receive excess franking credit refunds, this person’s balance on retirement at age 67 would be reduced to $1,983,318. This is a dramatic $520,392 (20.78%) hit of this person’s retirement funds. Regardless of the amount of your starting income SHIFTY SHORTENS TAX GRAB will have 20.78% NEGATIVE impact on your retirement funds!! 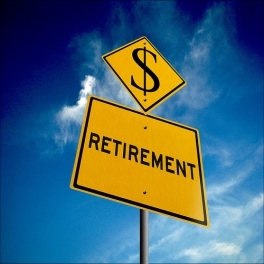 IT’S YOUR RETIREMENT FUTURE AT STAKE, ACT NOW!! next post: Shut up – or else!